… that LECHUZA is a brand of geobra Brandstätter Stiftung & Co. KG. The successful family enterprise has operated for over 130 years and has produced a wide variety of different products in its history: From box hinges to telephones, piggy banks and shop items, to toys and planters. … that the Brandstätter Group has been famous across the globe since 1974 for its PLAYMOBIL brand of toys. … that the first LECHUZA planter prototypes were designed in 1998, and the successful market launch followed in 2000. … that LECHUZA planters have received numerous international awards each year since 2007 – including the renowned “red dot design award” multiple times. … that one of every three planters in German offices is a LECHUZA brand planter. … that LECHUZA was able to maintain the level of sales achieved in the previous year despite the financial crisis in 2009. … that since February 2010 the first LECHUZA balcony box is available in two sizes? The Cottage surface structure is finished in the woven design popular in wicker furniture and creates striking accents on any balcony railing. … that since 2010 all LECHUZA models are sold in the All-in-One Set. 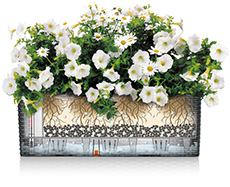 The practical All-in-One Set includes a planter, a plant liner (depending on the model) and the LECHUZA sub-irrigation system.